Using FBX as an alternative to Cal3D, exporting individual meshes, groups of objects or entire projects to IMVU from Blender is now much easier. Ensure bones and nodes are set up correctly. Check meshes are properly parented to their respective skeletons. Check Material names, remove unused or duplicates (unless intended). Reset meshes (Apply) and optionally triangulate (Tessellate). Ensure meshes have UV maps with image assigned. Mesh and skeleton should be positioned grid-centre (rooms and furniture), or relative to the bone they will attach to. Geometries select Apply Modifiers (optional - disable for Shape Keys/Morphs). Armatures deselect Add Leaf Bones. Animation deselect NLA Strips and optionally Force Start/End Keying. Once done click the Export FBX button top-right to export an FBX file (*.fbx) that’s then ready for import into IMVU. When exporting animations make sure each sequences has an Action else the animation won’t work in IMVU – animate using the Action Editor instead of the Timeline Editor. 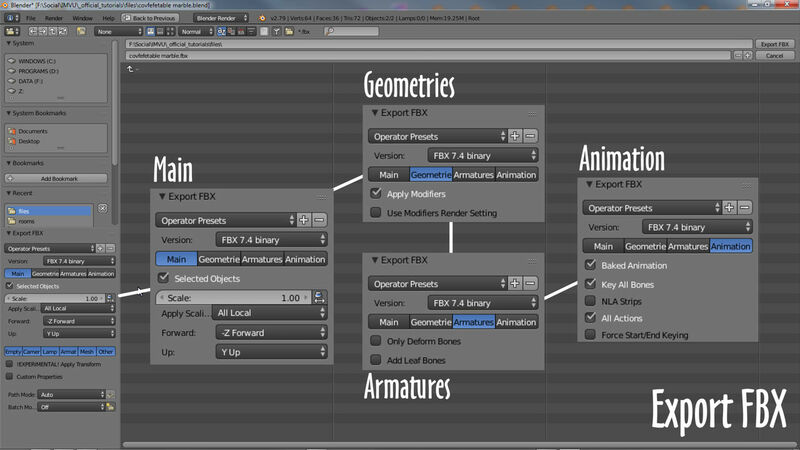 Export settings for saving a project as an fbx file in Blender. 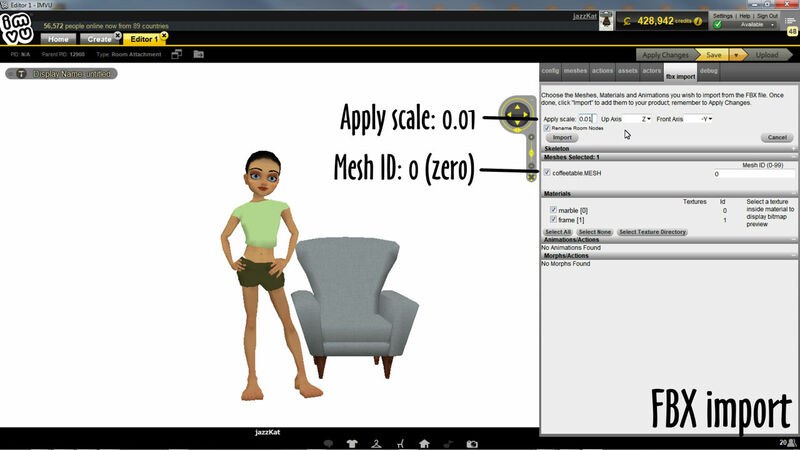 Importing FBX files into IMVU differs slightly depending on the product type, largely due to differences in skeleton set up and use, importing a Pose for example, the Select Skeleton Root dialogue will be displayed whereas it might not for a furniture item or room. IMVU will convert the selected data, creating a set of compatible XML files (xrf, xmf, xsf, xpf and xaf). Once done the FBX Import panel will appear blank confirming import. Finally click the Apply Changes button to see the result automatically assembled in the Editor. If there are issues the Import Status dialogue will list them and either allow continuation of the process (warning about textures or meshes being replaced) or force cancellation (problems with the file itself). The main import panel for bringing in FBX files… of importance for Blender users is setting Apply scale to 0.01 else everything is HUGE!